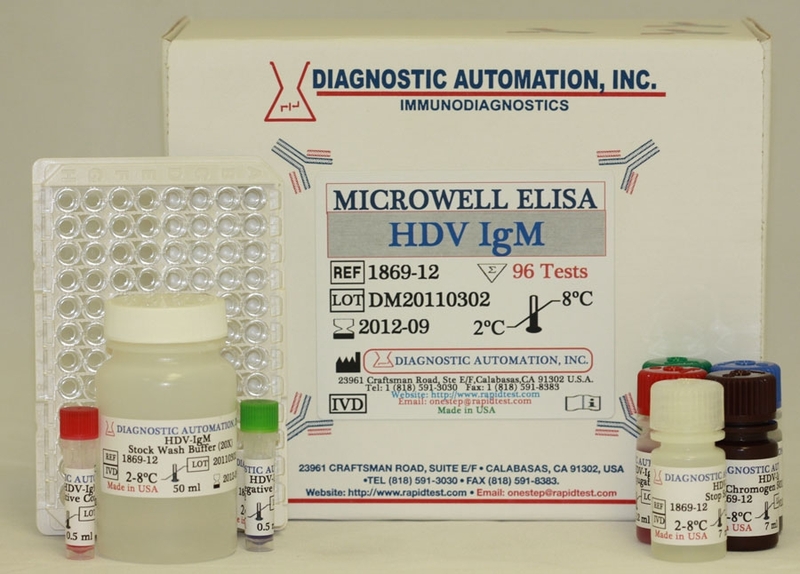 HDV IgM ELISA kit | GMP | 818-591 3030 USA. 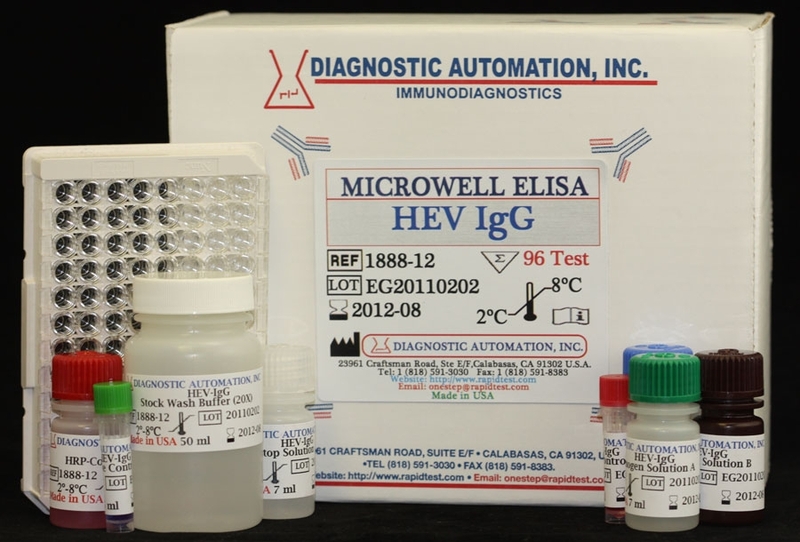 Diagnostic Automation Inc. offers an HDV IgM ELISA kit, which is an enzyme-linked immunosorbent assay for the qualitative detection of IgM-class antibodies to hepatitis D virus in human serum or plasma. The HDV IgM ELISA test is designed for clinical lab diagnosis of patients who are suspected of having a hepatitis D virus (HDV) infection. 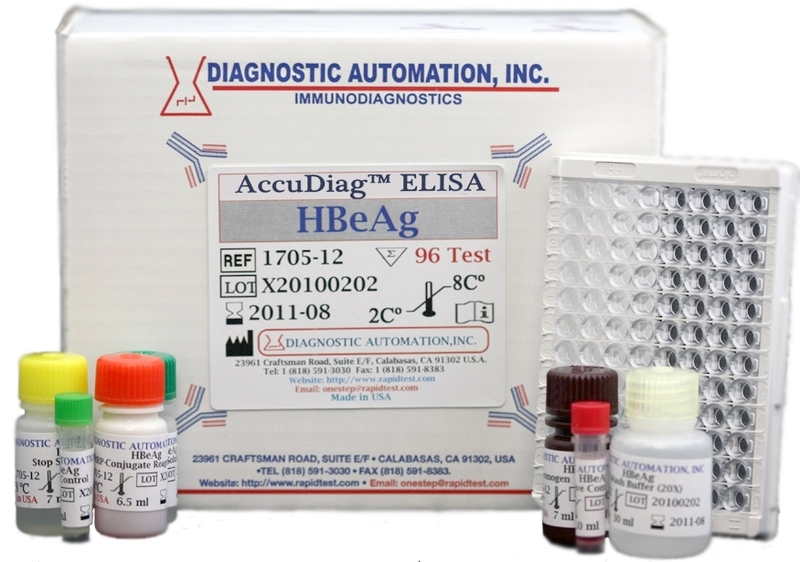 The Sensitivity of the HBcAb IgM ELISA kit is 100% and the Specificity is 100%. What causes Hepatitis D virus is an agent known as Delta agent (a defective 36nm-43nm RNA virus) which puts it into the classification of Hepatitis delta virus. Hepatitis D can only reproduce when it is linked with Hepatitis B virus (HBV). The disease is transmitted through the skin or through sexual contact with infected blood. Generally, the relationship of HDV and HBV involves some of the most acute and chronic HBsAg carriers. Because of this co-infection, it is important to know whether the HDV and HBV developed at the same time, or if the patient was already a carrier of HBsAg. The co-infection, especially super-infected HDV, can develop into severe acute hepatitis disease. Chronically infected HBV patients infected with HDV have a 70-80% chance of developing cirrhosis of the liver. Serologically, it is important to know the specific HDV antibodies (anti-HDV) or antigens. The first antibody to appear at the acute stage is IgM anti-HDV, which is transient and quickly replaced by IgG anti-HDV. If the IgM anti-HDV infection persists, a chronic HDV infection develops and continues to reproduce. Through the course of HBV-HDV co-infection, and after the tenth week of exposure, identifiable concentrations of HDV antibodies appear. If cleared up during convalescence, then evidence of recovery is shown. An important marker for diagnosis and post treatment of patients during early infection stage is the serological detection of IgM class antibodies. Early recovery during HDV co-and-acute super infection is shown by decreasing or low titers of IgM; chronic carrier stage is signaled by elevated levels of IgM. directed to human IgM (anti-u chain) are pre-coated on the polystyrene microwell strips. During the first incubation stage, after serum or plasma is diluted, any IgM antibodies present will be captured in the wells. After wash, what becomes visible after adding purified HDV antigens conjugated-HRP, is the distinct HDV IgM captured on the solid phase. In the course of the second incubation stage, conjugated antigens will individually react solely with the specific HDV IgM antibodies. Washing the wells to remove unbound conjugates is important at this juncture so that the conjugated antigens can individually react only with the specific HDV IgM antibodies. For additional details please refer to the instructions for use. Product inserts for most Infectious Disease ELISA kits follow a similar method. 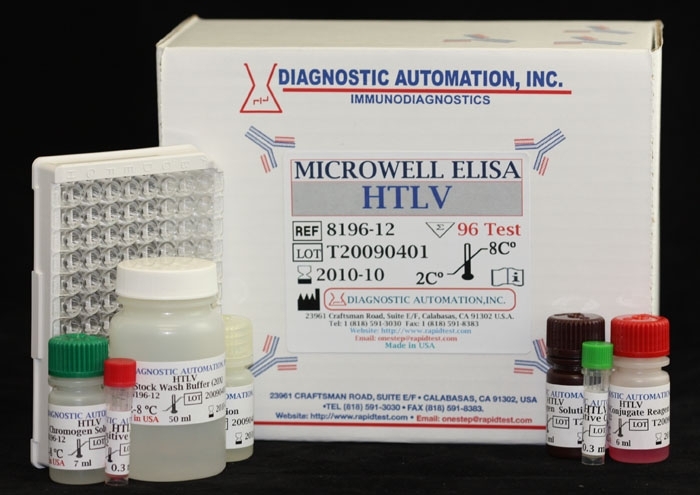 See the HDV IgM ELISA Kit product insert for details on preparation, procedures, quality control, and test result interpretation. 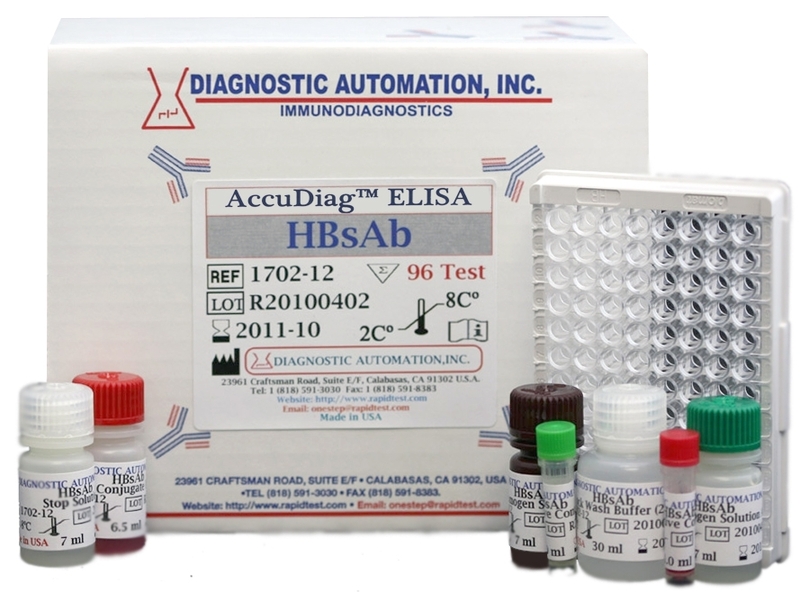 Diagnostic Automation Inc. also provides other Infectious Disease ELISA Kits. For more information about ELISA Kits, Rapid Tests, IFA Kits, CLIA Test Kits, or Serology tests, please see our website home page, or contact our Customer Service Representatives at 818-591-3030. HDV IgM ELISA Test is for clinical lab diagnosis and treatment of patients who are suspected of having a hepatitis D virus infection. The HDV IgM ELISA test is an enzyme-linked immunosorbent assay for qualitative identification of IgM-class antibodies to hepatitis D virus in human serum/plasma.